Best wishes to Tamakia as she celebrates her upcoming 40th birthday! 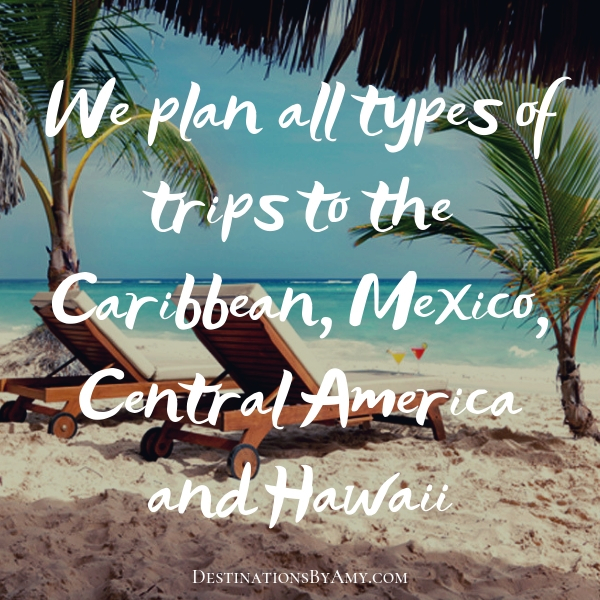 I have chosen Destinations by Amy to work with all of my friends to coordinate their travel arrangements to make this process as stress-free and fun as possible for our entire group. 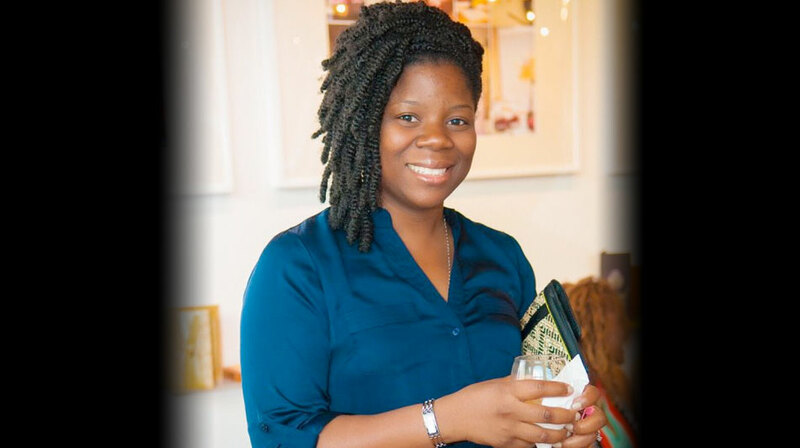 Working with our Group Travel Specialist, Kathy Karavitis, is complimentary to you and helps us me keep things organized for my birthday celebration. It is very important that you touch base with Kathy to make your travel arrangements so that my celebration weekend comes together with ease. You are in excellent hands! When you are ready to book your stay, please fill out the form below. 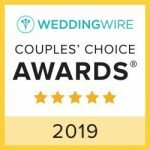 Remember that deposits are due at the time of booking, and Kate Rickard is the Group Travel Specialist for all of the travel planning for the Destination Wedding. She looks forward to hearing from you very soon. Once your submit your form, our Group Travel Specialist will contact you within 2 business days via email with your personalized reservation. Sometimes our emails can end up in spam! Please check your junk or spam folder over the next 48 hours and add kathy@destinationsbyamy.com to your “Safe Sender” list in your email client. 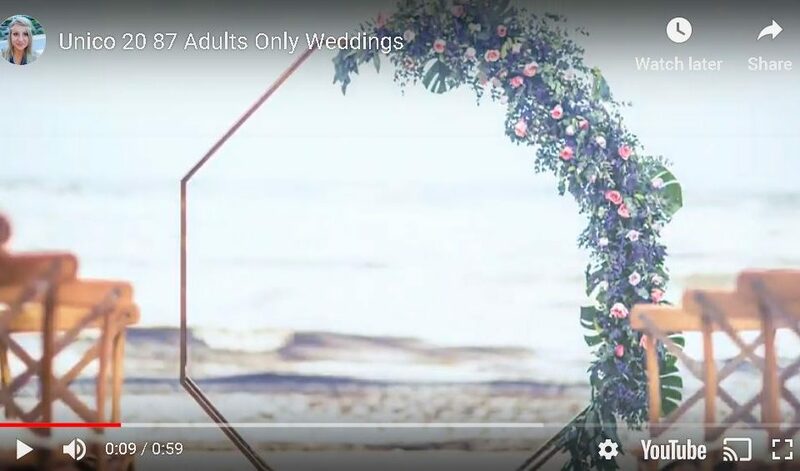 At that time you will have 24 hours to review your reservation and respond indicating any changes before your credit card is charged for the deposit amount indicated on the wedding web page (land deposit + Travel Protection). If you indicate on the form that you also wish to purchase air, you will have a chance to review flights and your entire package before your card is charged. Please check your email. Whom may we thank for your referral? Traveler 1 Information - Passenger name MUST match passport (required for international travel) or government issued ID (required for domestic travel) exactly. Traveler 2 Information - Passenger name MUST match passport (required for international travel) or government issued ID (required for domestic travel) exactly. Traveler 3 Information - Passenger name MUST match passport (required for international travel) or government issued ID (required for domestic travel) exactly. Traveler 4 Information - Passenger name MUST match passport (required for international travel) or government issued ID (required for domestic travel) exactly. Traveler 5 Information - Passenger name MUST match passport (required for international travel) or government issued ID (required for domestic travel) exactly. Traveler 6 Information - Passenger name MUST match passport (required for international travel) or government issued ID (required for domestic travel) exactly. Traveler 7 Information - Passenger name MUST match passport (required for international travel) or government issued ID (required for domestic travel) exactly. Traveler 8 Information - Passenger name MUST match passport (required for international travel) or government issued ID (required for domestic travel) exactly. Traveler 9 Information - Passenger name MUST match passport (required for international travel) or government issued ID (required for domestic travel) exactly. Traveler 10 Information - Passenger name MUST match passport (required for international travel) or government issued ID (required for domestic travel) exactly. By signing, I have been informed of the travel insurance coverage available to me and have chosen to decline travel insurance coverage for myself and the other members of my traveling party. NOTE: We cannot add "Cancel for any reason travel insurance" after deposit. I have been offered the option of purchasing trip cancellation/interruption insurance. I understand that discounted fares and vacation packages typically involve restrictions and that changing any aspect of my travel arrangements may result in payment of additional money. Furthermore, I understand if trip cancellation insurance has not been purchased, the package will be non-refundable or cancellable for any reason and I will be liable for the entire package price owed. By signing here, you authorize Destinations by Amy to submit your credit card to your travel vendor for the amount of the deposit, plus travel insurance (when chosen), and air fare fees (when requested). You will receive an email confirming the amount to be charged to your credit card prior to the charge(s) being processed. 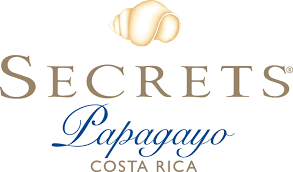 Set on Papagayo Bay along the Pacific coast of Costa Rica, Secrets Papagayo Costa Rica sits on a black, volcanic sand beach, which when coupled with lush, mountainous surroundings provides a stunning backdrop for an intimate, relaxing and romantic getaway. This oceanfront resort boasts 202 spacious suites with finely-appointed amenities, a private terrace or patio, and all the benefits of the Unlimited-Luxury experience. Indulge in 24-hour room service, a daily refreshed mini-bar, limitless gourmet dining and top-shelf spirits at four restaurants, one cafe and five bars, pool and beach wait service, nightly entertainment and more. The full-service Secrets Spa by Pevonia is a sanctuary for the senses, offering rejuvenating treatments and packages. Enjoy the natural scenery and attractions of Costa Rica by visiting the Marina Papagayo, located nearby which boasts world-class sport fishing, a pedestrian village, gardens and picturesque walk- ways. An unparalleled experience awaits at Secrets Papagayo, just 20 minutes from the Liberia Airport and 30 minutes from down- town Liberia. With a total of 5,921 sq. miles and more than 400 miles of coast line, the Guanacaste tourism area comprises the Pacific Coast area from the border of Nicaragua to the Bongo River estuary in the Nicoya Peninsula. This tourism area is home to a very important section of Costa Rica’s cultural and natural heritage. This area boasts a significant number of protected areas including water, land, mountain, and coastal ecosystems that are teaming with life. The incomparable beauty of its landscapes, which ranges from tropical dry forests to lowland mountain forests, its warm climate, as well as its flourishing nature have made Guanacaste one of the most heavily visited areas by locals as well as international tourists and is one of the most developed areas because of its high level of investment in the hotel industry that is in high demand. It also relies on important support by the Tourism Development Center of the Gulf of Papagayo and also relies on the Daniel Oduber International Airport through which arrive a number of charter and commercial flights from the United States. All along the Guanacaste coastline are a number of beaches where you can swim in their warm Pacific Ocean waters. The coastal landscape is exceptional. There is an array of white-sand beaches and calm, intense-blue waters. 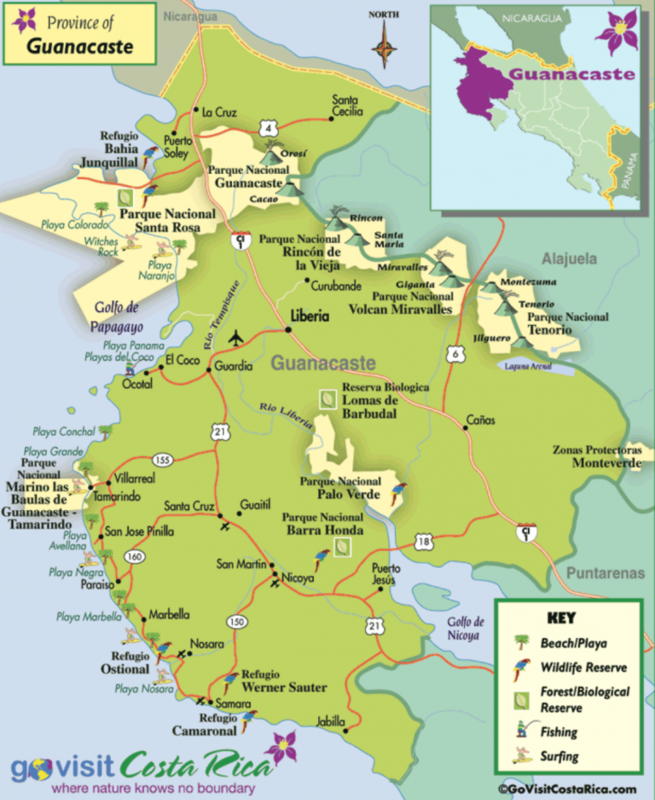 to learn more about Guanacaste, CLICK HERE. Passports are required for this trip. 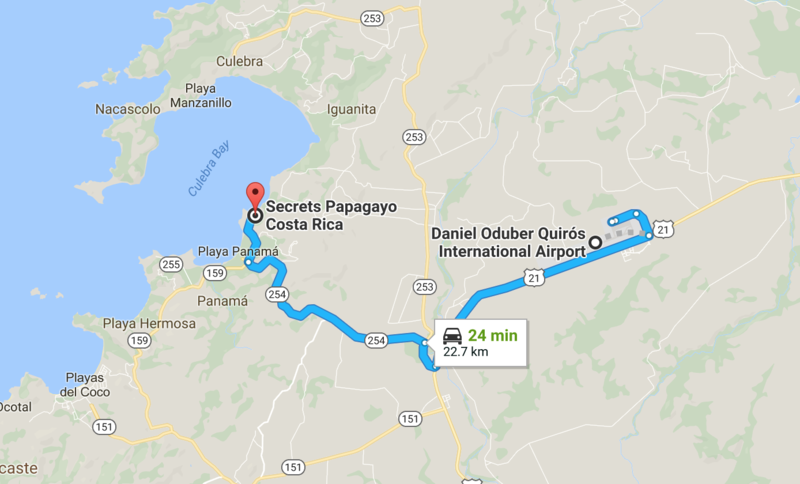 Airport Transfers: Round-trip, shared airport transfers from the Daniel Oduber Quirós International Airport (LIR) are included in your package.Upon arrival at the airport, a representative from the transportation company will meet you outside the terminal and direct you to your shared vehicle. Pick up times are scheduled per your flight arrival times. For your return flight, your transfers will pick you up at Secrets Papagayo approximately 3 hours prior to departure. Once final payment has been made, all payments are non-refundable. Air Reservations: Air Reservations may be purchased through Destinations by Amy with your booking OR you may book air on your own. Please note that air bookings will require a higher deposit based on the type of air you request. Option #1: If you would like Destinations by Amy to research and book the best-valued airfare for you, we are happy to do so. An international airfare booking fee of $50 per person will be added to your deposit. Please note that you would like us to research air options for you in the comment section of the booking form. Option #2: If you book your airfare on your own, proper flight information must be provided to Destinations by Amy and must include the following: names of each passenger as shown on their passport, airline, dates of travel, flight numbers, departure & layover airports, departure and arrival times, and record locator. Forwarding your confirmation directly from the airline to Destinations by Amy will allow for all of this information to be provided correctly to our travel providers. Current air information is crucial for the on time arrangement of your round-trip airport transfers. Travel Insurance: Destinations by Amy strongly suggests the purchase of travel insurance. Travel insurance must be purchased at the time of deposit to reap all of its benefits. It is Cancel For Any Reason insurance and helps with baggage and weather protection. This travel protection also assists with changes and fees from booking through travel. Plus, when you purchase the insurance, your deposit is only for the amount of the insurance. Ask Kathy for more details! The travel dates for Tamakia’s birthday celebration are 7/12/18-7/16/18. Includes Nonstop, Round-Trip Airport Transfers, Double Occupancy Accommodations, All Food, Drink, Entertainment and Much More on Resort as well as all taxes. • Personalized check-in and check-out with concierge service. • Preferred status and amenities. • Private Preferred Club Lounge. • Upgraded mini-bar service and bath amenities. • Daily Continental breakfast service, afternoon hot and cold hors d’oeuvres, exquisite desserts and fine liquors served in the Preferred Club Lounge. • Complimentary computer access in the Preferred Club Lounge. • Complimentary newspaper in room every day (available in English and Spanish). All accommodations include: slippers, ceiling fans, smoke detector, desk, soundproof, hairdryer, sprinkler system, housekeeping, telephone, iPod docking station, television (remote controlled, cable), internet access (high speed, wireless), turndown service, iron, voicemail, CD player, mini-bar (fully stocked), wake-up calls, DVD player, mirror (vanity), air conditioning (individual climate control), non-smoking accommodations, alarm clock, pillow menu, bathrobe, radio, bathtub (some accommodations), room service (24-hour): ($), bedding (premium), safe (electronic), blackout drapes, shower (private) and coffee maker. Want a longer or shorter stay? Kathy, our Group Travel Specialist, will be happy to help you customize your travel plans. Why book your travel with Destinations by Amy? 1. The bride and groom have put their trust in us to plan a successful destination wedding for them. The best way for us to manage their wedding plans is to book and manage every reservation so we can coordinate each detail of the wedding event. This relieves stress for the bride and groom and all of their guests. 2. The bride and groom have already set aside a room block and signed a contract for those rooms. Rooms booked outside of their block do not count towards fulfilling their contract. 3. The team at Destinations by Amy is committed to giving you personal and individual attention. You will be treated like the valued client that you are and not merely a confirmation number! We are able to customize your trip any way you like, and can even help if you’d like to extend your stay, change resorts, or bring your family. Please allow us to make sure your travels are handled with our service and expertise. 4. We monitor your reservation and keep you informed of any changes that could occur. Even after you finalize your booking, we will be with you to make certain everything goes smoothly. 5. You will be part of the wedding group and the resort will treat you as a destination wedding VIP guest. You will appear on our final guest list that gets sent to the resort prior to arrival. 6. We work hard on getting you the best price. If you see a less expensive price for the exact package – dates, airline, airline times, taxes, insurance, transfers, etc. – give us the opportunity to work with you to see if we can get the same price. This way we can book your reservation and you can become part of the wedding party. Online prices usually do not include all that we have negotiated for the group. Please give us the opportunity to help you with this.